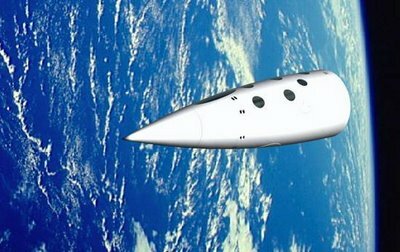 [Image: "PlanetSpace's Silver Dart spacecraft could one day launch space tourists into orbit from a Nova Scotia spaceport and land 45 minutes later in Sydney, Australia." New Scientist Space]. Canada's first spaceport will soon be under construction – privately owned and operated: "The province of Nova Scotia has signed an agreement setting aside 300 acres of government-owned land for US-Canadian private space firm PlanetSpace to construct a rocket launching facility." The company "hopes to develop a space tourism business, ferrying customers into space in suborbital and eventually orbital flights. 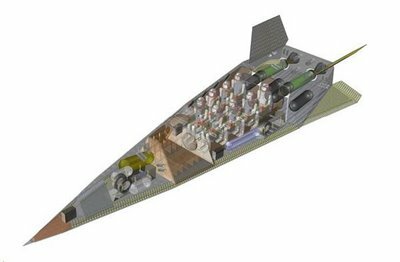 The first suborbital launch should occur "by late 2008 or early 2009." [Image: PlanetSpace's "suborbital crew vehicle." New Scientist Space]. "As for environmental concerns, Geoff Sheerin, CEO of PlanetSpace, says the company has chosen to use ethyl alcohol fuel for its rockets because it is environmentally friendly. 'Our fuel comes from corn,' Sheering told New Scientist. 'Even if it gets in the water, it dissipates very quickly with no damage to the environment. It's a green rocket, so to speak.'" 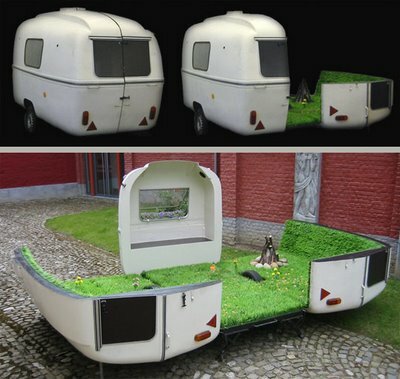 Speaking of green, you can now unpack a park over at Inhabitat: "It's a mobile trailer that unfolds into an elevated park replete with a fire circle and wildflowers." I've ordered 149,000 of them. I am starting a fiefdom in the Yucatan. Meanwhile, "Hollywood-style" security systems are now ready for installation in your very own home; they won't protect you, but they will use eye-catching red lasers meandering back and forth across the room in unpredictable patterns to make your house look really cool (and thus worth breaking into). More here. Then there's the inadvertant pruning effects of hurricanes Rita and Katrina – or the hurricane as landscape architect: "The Chinese tallow tree is invading the US Gulf coast forests, replacing the region's native hardwoods. The tree's advance is a direct consequence of the ecological disruption caused by hurricanes Rita and Katrina." For a variety of reasons, I was fascinated to read that the tallow tree is "an ornamental species introduced by Benjamin Franklin in 1772." It can "quickly grow to 10 metres and is resilient to many pests." Whoops. 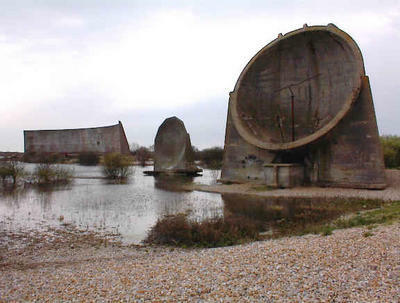 The Athanasius Kircher Society revisits England's sound mirrors: wartime acoustic reflectors used to amplify the sounds of distant Nazi aircraft. For a bit more on the sadly derelict structures, see earlier on BLDGBLOG – or visit The Sound Mirrors Project. Your inner earth-catastrophist should be sweating with glee: "More than half of the world's major forests will be lost if global temperatures rise by an average of 3ºC or more by the end of the century," the Guardian reports. "Extreme floods, forest fires and droughts will also become more common over the next 200 years as global temperatures rise." That's in addition to the Guardian's earlier prediction that "floods, malaria, shark attacks, sweltering summers and worsening drought" will all become more common. Shark attacks? It seems higher temperatures "will confuse wildlife." The Guardian continues, warning elsewhere that the UK will soon become a "tinderbox" in which whole peatlands may go up in flames, radically accelerating climate change due to the rapid release of stored carbon. With climate change on the brain, it's never too late to take another look at Land+Living's February 2006 article about sustainable car parks in Los Angeles – including some wonderfully misguided comments at the end. The actual project under question is a proposal for re-landscaping the surface parking lots of L.A., using, for instance, embedded solar power generators and permeable paving. [Image: From Scott Webel's and Jen Hirt's Museum of Ephemerata]. The Retrospective, originally intended as a guide to the Museum's now-closed machines show, gleefully participates in that under-appreciated genre of the guide to temporary collections of objects. Walter Benjamin would be proud. From the text: "Everywhere around us the Machines clank, whir, and buzz, producing ultra-modern objects alongside archaic effluvia, vast landfills of trash – and vast, trashed landscapes. Inside two centuries, they have infiltrated every social nook and bodily cranny. They service and are serviced... What is this massive force in natural history? Just what are the Machines?" Read further and learn about the Moonlight Towers, Orgone Accumulators and Dreamachines, and even a replica UFO – then drive to Texas and visit the museum in person. 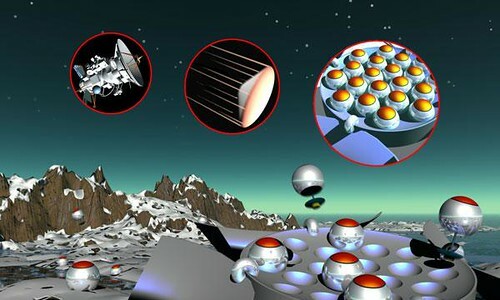 One more thing: speaking of machines, spherical micro-robots may one day explore Mars: "The micro-robots could land on the surface of another planet arranged in a capsule like eggs in a carton. Or they could be dropped onto the planet by a balloon floating above the surface. They would move by rolling and bouncing, powered by artificial muscles that alter their overall shape." The robots "would each be a few centimetres in diameter, about 100 grams in weight, and would be able to jump about 1.5 metres in a single bound, travelling 50 kilometres over their lifetimes." They would be particularly useful in extraterrestrial spelunking: "the micro-robots could position themselves to enable communications from deep within a cave. Each one would act as a relay, passing messages back to a central unit. Fifty micro-robots lined up in this manner could theoretically explore a cavern a kilometre deep." We should therefore send them to Titan, one of Saturn's moons – because it "may be riddled with caves... presumably carved out by the methane rain that is thought to fall on Titan." How the hell do you find these things? 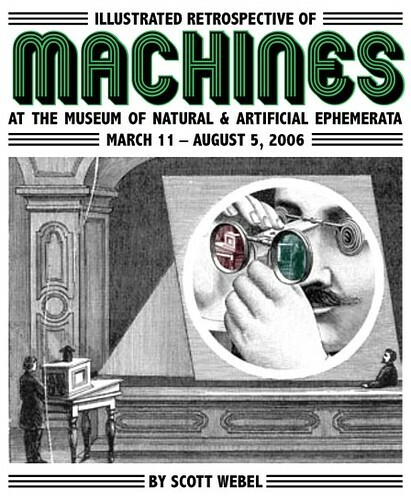 I'm in Austin, and so just missed the Museum's Machines show. Love all the other fun stuff you link to.